This bracket allows Vikan's 6L bucket 5688x and 12L bucket 5686x to hang when filled and it can store both Vikan's 6L 5688x , 12L 5686x and 20L 5692x buckets up-side-down after cleaning. A small hook on the bracket allows for lid or brush storage, ensuring optimal hygiene levels.ls. 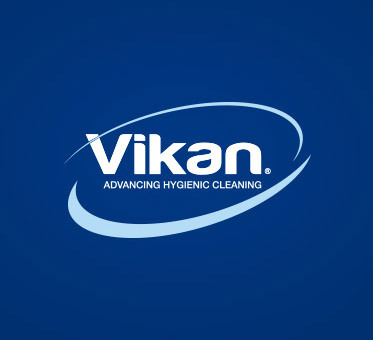 The Vikan Flexible Mop Frame is designed for use with our ergonomic handles to clean floors, walls, ceilings, tables and other flat surfaces, as well as curved surfaces such as revolving doors, bathtubs, jacuzzies, curved plastic seats and vehicle windows. 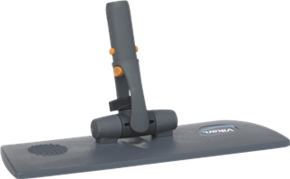 Comes with the new Easy Shine Kit or sold separately for use with a range of Vikan mop handles. 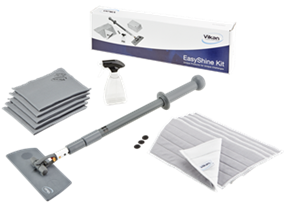 The Vikan Easy Shine Kit with Flexible Mop Frame is a complete solution for cleaning windows, mirrors, tiles, stainless steel, white boards and other high gloss surfaces, including curved surfaces such as such as revolving doors, bathtubs, jacuzzies, curved plastic seats and vehicle windows. The kit includes 5 Window Mops (549125), 5 Lustre Cloths (691540), 1 Spray Bottle (581210), 1 Ultra Flex Mop Frame (374118) and 1 Telescopic Handle (295610). Adapter from thread to click, 22 mm. Most of what we can do for your business is rooted in who we are. If you haven't yet visited our "About us" page, take a few moments and learn a bit about our history, our values and more.